Stand out from the crowd with a quality Harley-Davidson® T-Shirt for men, emblazoned with a stunning Chester Harley-Davidson® motif on the back. Harley-Davidson® Men's H-D® Brown Short Sleeve Tee features a Harley-Davidson® script, with Bar & Shield® logo printed on front. This short sleeve tee is finished with our exclusive Manchester Harley-Davidson® New Goals dealer backprint. 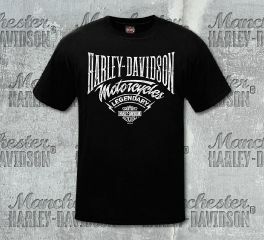 Harley-Davidson® Men's Into The Deep Black Short Sleeve Tee is made from 100% cotton. 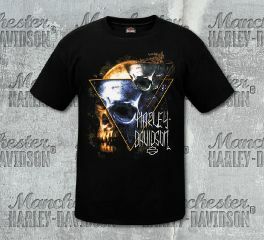 It features a Harley-Davidson® script, Bar & Shield® logo, and skull graphics printed on front. This short sleeve tee is finished with our exclusive Manchester Harley-Davidson® New Goals dealer backprint. 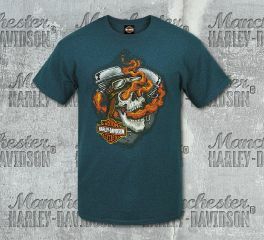 Harley-Davidson® Men's Flame Yell Dark Cyan Short Sleeve Tee is made from 50% cotton, 50% polyester. It features a flaming skull graphics with Bar & Shield® logo printed on front. This short sleeve tee is finished with our exclusive Manchester Harley-Davidson® New Goals dealer backprint. Harley-Davidson® Men's Road Grunge Short Sleeve Tee features a road graphics printed on front, and finished with our exclusive Manchester Harley-Davidson® New Goals dealer backprint. Harley-Davidson® Men's MC Script Black Short Sleeve Tee features a Harley-Davidson® motorcycle script printed on front. This short sleeve tee is finished with our exclusive Manchester Harley-Davidson® New Goals dealer backprint. 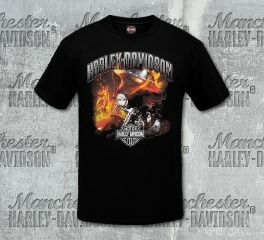 Harley-Davidson® Men's Bike Blaze Black Short Sleeve Tee is made from 100% cotton. The front features a blazing Harley-Davidson® motorcycle graphics printed on front. This short sleeve tee is finished with our exclusive Manchester Harley-Davidson® New Goals dealer backprint. Harley-Davidson® Men's Clown Line Black Short Sleeve Tee features a clown line graphics printed on front with the classic Bar & Shield® logo. This short sleeve tee is finished with our exclusive Manchester Harley-Davidson® New Goals dealer backprint. Harley-Davidson® Men's Progression Black Short Sleeve Tee features a Harley-Davidson® script, and motorcycle graphics printed on front. This short sleeve tee is finished with our exclusive Manchester Harley-Davidson® New Goals dealer backprint. 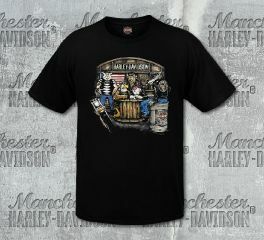 Harley-Davidson® Men's Garage Animals Black Short Sleeve Tee is made from 100% cotton. It features a graphic pictures of Pig, Bull, Bald Eagle, Bull Dog and Wolf hanging out in a garage scene. This short sleeve tee is finished with our exclusive Manchester Harley-Davidson® New Goals dealer backprint. Harley-Davidson® Men's Therapy Black Short Sleeve Tee is made from 100% cotton. The front features "the only THERAPY i need" script printed on left chest, with the classic Bar & Shield® logo. This short sleeve tee is finished with our exclusive Manchester Harley-Davidson® New Goals dealer backprint. 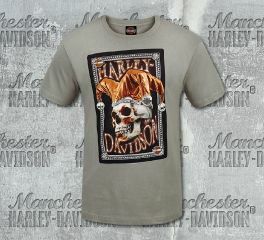 Harley-Davidson® Men's Jest Passing Short Sleeve Tee is made from 100% pure cotton. It features a skull with clown hat graphics printed on front, and finished with our exclusive Manchester Harley-Davidson® Bee Custom dealer backprint. Harley-Davidson® Men's Black 114 Screamin' Short Sleeve Tee s made from 100% pure cotton. It features a Motorcyle graphics and Harley-Davidson® script printed on front, and is finished with our exclusive Manchester Harley-Davidson® Bee Custom dealer backprint. 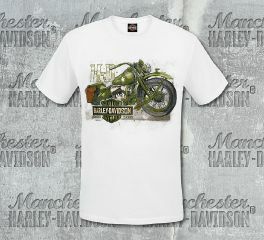 Harley-Davidson® Men's White Sketch Military Short Sleeve Tee is made from 100% pure cotton. It features a Harley-Davidson® motorcyle graphics printed on front, and finished with our exclusive Manchester Harley-Davidson® Bee Custom dealer backprint. Christmas is approaching! This Harley-Davidson® Men's Red Be Good Short Sleeve Tee is perfect for this important celebration! It is made from 100% cotton and features a Santa Claus graphics with the Classic Bar & Shield® logo printed on front. This short sleeve tee is finished with our exclusive Manchester Harley-Davidson® Bee Custom dealer backprint. 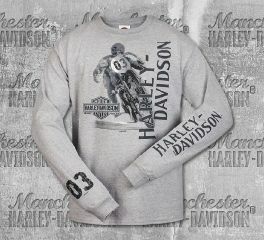 Harley-Davidson® Men's Grey Racer Side Long Sleeve Tee is made from 90% cotton, and 10% polyester. 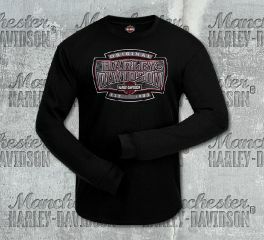 It features a racer graphics and Harley-Davidson® lettering printed on the front and on the left sleeve. 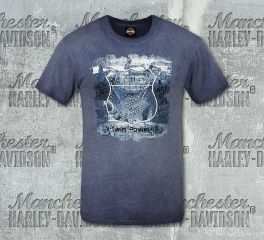 It is finished with our exclusive Manchester Harley-Davidson® Custom Skyline dealer backprint.